The Bay of Bengal Initiative for Multi-Sectoral Technical and Economic Cooperation was established 21 years ago as a regional organisation of four South Asian nations and two Southeast Asian nations. It is holding its fourth summit in Kathmandu on August 30-31 with the presence of leaders of Bangladesh, India, Sri Lanka, Bhutan, Thailand, Myanmar and host, Nepal on the theme of ‘Towards peaceful, prosperous and sustainable Bay of Bengal region’. The awkwardly named regional body better known by the acronym Bimstec has been a long time in gestation. The sub-regional body was formed in June 1997 to bring together the littoral states of the Bay of Bengal and act as a bridge between South Asia and Southeast Asia. It held its first summit in Thailand in 2004 when the Bangkok Declaration was concluded and Nepal and Bhutan joined the organisation for better regional integration and access to the sea. A second summit was held in India in 2008 and the third summit took place in Myanmar in 2014. A permanent Bimstec secretariat was established in Dhaka in 2014. The Bay of Bengal body has been in existence for over two decades, but it still suffers from a lack of visibility. One Bimstec envoy said at a pre-summit conference: “Even within the Bimstec nations, the organization is not very well known.” Unlike other regional organisations that have high profile summits, Bimstec activities are mainly through working groups. This lack of awareness of Bimstec was evident in Nepal before the summit when some commentators remarked that the organization was of no benefit to Nepal since Nepal is not a Bay of Bengal nation. Bimstec was a ploy that was being used by India to push Saarc into the background, it was said. Refuting the critics, Nepali Prime Minister KP Oli explained his government’s priorities in Bimstec as economic cooperation and connectivity, whether railways, land transportation, airways and energy. Bimstec received a boost in 2016 when India invited its leaders for the outreach programme during the Brics summit in Goa. The invitation was an indication of New Delhi’s renewed interest in the sub-regional body, especially as Saarc process had stalled. 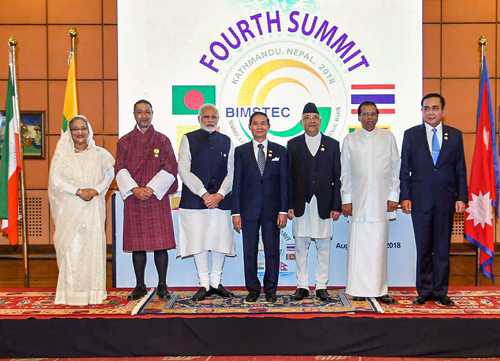 Though the next Bimstec summit was delayed, the leaders meeting in Goa gave a push to cooperation in areas such as security and disaster management. The National Security Advisors of the seven nations have held two meetings within a span of 12 months, discussing traditional and non-traditional challenges. The region is home to 1.6 billion people, comprising 22 per cent of the world’s population and a gross domestic product of $2.8 trillion but is amongst the least integrated regions of the world. It faces the challenge of poor connectivity that has resulted in low trade volumes within the region. Bimstec has not made much progress in increasing intra-regional trade, though it has taken steps in other areas of common interest. But those are not areas that attract much public attention. Bimstec has identified 14 priority sectors, with each member acting as lead coordinator for one or two sectors. There has been growing opinion among the members that this structure has led to diffusion of energies among the large number of areas and Bimstec should concentrate of four priority areas that can be implemented successfully. Connectivity is one of the main components of the Bimstec agenda, for providing physical connectivity whether by land or by sea, grid connectivity for energy and people-to-people contact. Regional integration can best be promoted by removing the plethora of rules and regulations that act as trade barriers and hinder investment flows while shipping, road transportation and air services agreements would make it easier for movement of goods and people within the region. Bimstec has enormous potential for promoting regional integration. For India it is a vehicle for advancing key Indian policies – regional connectivity, Act East policy, Neighbourhood First and development of its Northeastern states. But Bimstec needs more funds for its programmes, and even more crucially it needs greater attention from Bimstec leaders. India should take the lead to provide the momentum that the low-key body requires. A Bimstec charter giving structure to its plans for the future and the energy generated through regular meetings of the leaders can be a way to invigorate the regional body.